It was a hot and windy day at Jack Russell Stadium with the winds blowing out to left field making for some favorable hitting conditions. Nate Pearson was unfazed by the tough conditions and immediately went to work in the 1st inning for his first start at Jack Russell Stadium. The righty struck out two and held the Marauders to the minimum in the first two innings. In the bottom half of the first the Blue Jays were able to manufacture a run with a wild pitch from Domingo Robles allowing Cullen Large to score from third. Even with the wind continuing to blow harder as the game went on, Nate Pearson continued dealing into the 3rd inning striking out another two and then striking out three of the four batters he faced in the 4th. The seven strikeouts through four innings set a new career high for the Odessa, FL native, but he still was set to pitch one more inning in the 5th of a 1-0 game. He kept his foot on the gas striking out Daniel Amaral and Michael Gretler for the Maruaders to finish his day with a career best nine strikeouts. He did so on 59 pitches and only allowed one hit bringing his season ERA down to 0.75 in three starts. A solid start was eventually followed up with an offensive outburst in the 5th inning. After Cal Stevenson grounded into a fielder's choice, he made it to third off of a Kevin Vicuna single into right field. Kevin Vicuna swiped second to put two runners and scoring position for Chavez Young with just one out. Chavez Young unloaded on a pitch from Domingo Robles for his first home run of the season, bringing the lead to 4-0 for the Blue Jays. Logan Warmoth saw what Chavez Young was able to do and took the first pitch he saw for a ride to collect his first home run of the year. The back-to-back home runs were the first of the year for Dunedin and gave the team extra breathing room with four innings to play. Graham Spraker came into relief, as he has done for every Nate Pearson, in the 6th inning. The Tuscon, AZ native continued his hot start to the year getting the first three batters out in the inning to hold Bradenton scoreless. Spraker got into a jam in the 7th inning with the first runner of the day getting to third base from a walk and a single. The righty stayed composed and got out of the inning unscathed heading into the 8th. The weather conditions finally came into play in the 8th inning for the Marauders as Dylan Busby was able to take one for a ride to close the lead to 5-2 for the Blue Jays. Again Spraker bounced back to get the next four batters out and finish the series off for Dunedin. Graham Spraker currently has a 1.69 ERA through 10.2 IP. 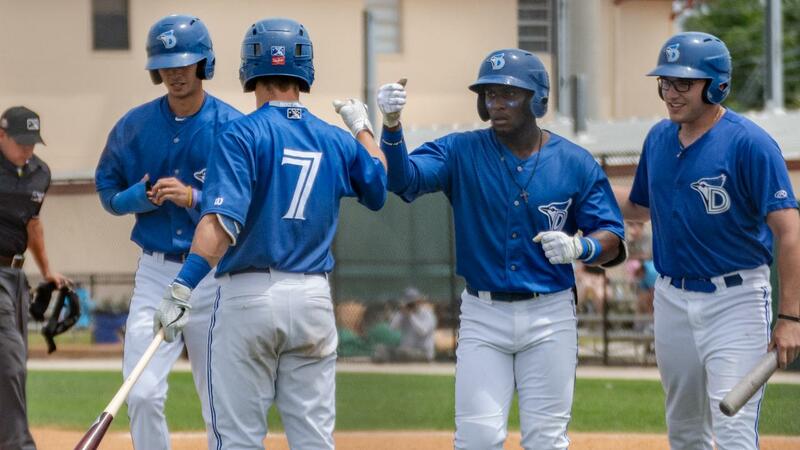 Dunedin looks to bring the momentum into their first series with the Charlotte Stone Crabs. Charlotte is currently 3-8 while the Blue Jays are 7-4. First pitch tomorrow in Port Charlotte is set for 6:30 p.m.